Part of the great Chanukah miracle came about because of a courageous Jewish woman named Yehudit. She went alone into the Greek army general’s tent, fed him cheese to make him thirsty and then wine to ‘quench’ his thirst. In so doing, he became so drunk that he fell into a deep sleep and she was able to kill him, becoming God’s agent in facilitating the eventual Jewish victory over the mighty Greek army. In her honor many have the custom to serve dairy foods on Chanukah. This one is a classic hit every time and is a welcome diversion to all the overly sweet things usually served at parties. Plus, it’s lighter on the oil than latkes are, as well as faster to prepare! In a large frying pan, place the oil and onions and begin to sauté. When they are light brown, add in the mushrooms, curry, pepper, salt and garlic powder and stir for about five minutes. Turn off the fire. 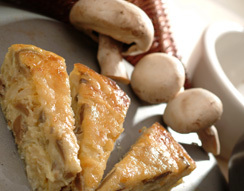 In a separate bowl, beat the eggs lightly with a fork and then add in the mushroom mixture. Stir. Add cottage cheese and half of yellow cheese; pour into a disposable pie pan of about 7-8 ” . Top with remaining cheese and bake uncovered for 45 minutes, until the top is light brown and the quiche is firm. If you happen to have any leftovers, it is also great cold the next day, or can be frozen and reheated for a different day. This recipe looks most appetizing when you take the time to lay it out properly in each person’s bowl individually. 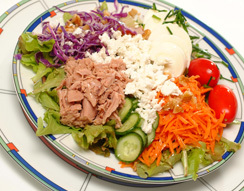 Shredded lettuce – shredded cabbage – cubed tomato pieces – cucumber pieces – olive rings and/or pickle pieces – some tuna – some sliced egg – crumple some white cheese over all – then add nuts to top of each plate for garnish. Serve with a choice of dressings of your choice in the center of the table for each person to choose from. For a healthier idea other than store bought dressings, drizzle on a bit of olive oil and fresh lemon juice to each plate. Combined with the crumbly cheese, you will usually find that this is quite tasty and no additional ‘salad dressings’ are necessary. Some also enjoy it with “zhatar” spice sprinkled on top of everything. Serves: as many people as you have tall glasses for! It’s best to use a glass that is tall, and is a bit larger than 8oz. for this one so that if it fizzes upwards, it will hopefully not go all over the place! Sprinkle on the 1/2 teaspoon of instant coffee. Powder will dissolve faster than large granules will. Pour in the 1/2 cup of milk. Pour in the soda water. Quickly dust some cocoa powder on the top of the foam, sprinkle on the chocolate shavings and/or the sprinkles, dip in the straw, stir a bit…and enjoy! 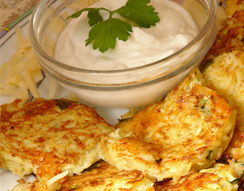 Well, it is Chanukah after all, so I just had to include some kind of latke. These are a nice twist off of the usual plain potato ones and are a bit less oily than the customary potato-only cousins. In a food processor fitted with the sharp metal “S” blade, process the onion until it is completely pureed. Add the eggs and process one more minute. Change the blade to the shredding device. Shred the zucchinis and potatoes onto the onion mixture. Pour this vegetable mixture out into a large bowl and add the potato starch, cheese, and fresh parsley. (**Adding it in really adds to the nice look and taste of this recipe. I only wrote it’s optional in case you have fussy little people who won’t eat them if they see ‘those green things’ coming out of their latkes…) Add in the salt and pepper. Mix well by hand. Take out a large frying pan and spray it well with a thin coating of baking spray. Add 1 Tablespoon of oil to this and start to heat it on a medium to high flame. You will use the other tablespoon of oil when frying up the second batch. At most, you may need to add one more additional tablespoon of oil in between batches, but normally, with a good quality pan, the 2 tablespoons is more than enough. Form small patties out of the cheese/vegetable mixture with the help of a milchig tablespoon and place them by spoonfuls onto the hot pan. Using your spoon, shape them a bit more to make them look nice while they are on the pan. Flatten slightly with a spatula. Let them sizzle until browned on the first side, then flip and do the same to the other side. You’ll be nicely surprised to see that this small amount of oil is sufficient to do the trick of ‘frying’ your latkes to a nice crunchiness. When they are done, lay them out on a flat plate that is lined with one or two paper towels, to drain them of the outside oil a bit more. See more recipes like this one in my gluten free (kosher for Passover as well) cookbook entitled “Pesach – Anything’s Possible!” from where this recipe & photo was taken. With best wishes for a very Happy Chanukah to all! You are currently browsing the archives for the Chanukah category.